This has been a big request for years. Finally it’s here!! The ‘Premium’ Round Loom Set is the ideal set for small gauge knitting, with pegs spaced at 3/8” apart. This is great spacing for using all your favorite worsted weight yarns. 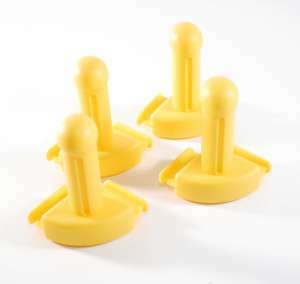 The looms are made of high grade plastic with a smooth finish, and stay put pegs. 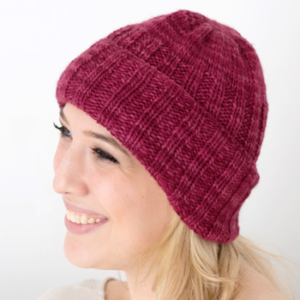 Knit hats in 3 sizes! Works super great for shawls, scarves, home decor, baby items, and much more! Loom sizes… small 64 pegs, medium 72 pegs and large 80 pegs. Available now at KB Looms. Here’s a few of our current hat patterns that work on the new looms. Click on photo for pattern. BEAUTIFUL! I cannot wait to get my poor arthritic fingers on these! Thank you AKB! I like Authentic Knitting Board looms. I have the oval loom set, but am used to using round ones. This looks tempting. I don’t see an extra peg where I can anchor my yarn, it would sure help me. Thanks. Are there any patterns other then hats for this loom? Does it take more then one code? Hi, Only one discount code can be entered for an order. We are working on many more patterns/projects. Just need to watch the blog each week. I’ve been waiting so patiently!! Love all the looms I find it easy to use a round looms but have and use the oval hat loom as well. Hi Donna, Thanks for your patience–we hope you enjoy. i am the proud owner of all KB Looms!!! I love all of them. I was sure hoping these looms were next!!! Thank you KB!! I cannot wait to get my hands on these!!!! YAHHHHHHHH!!!!!!! 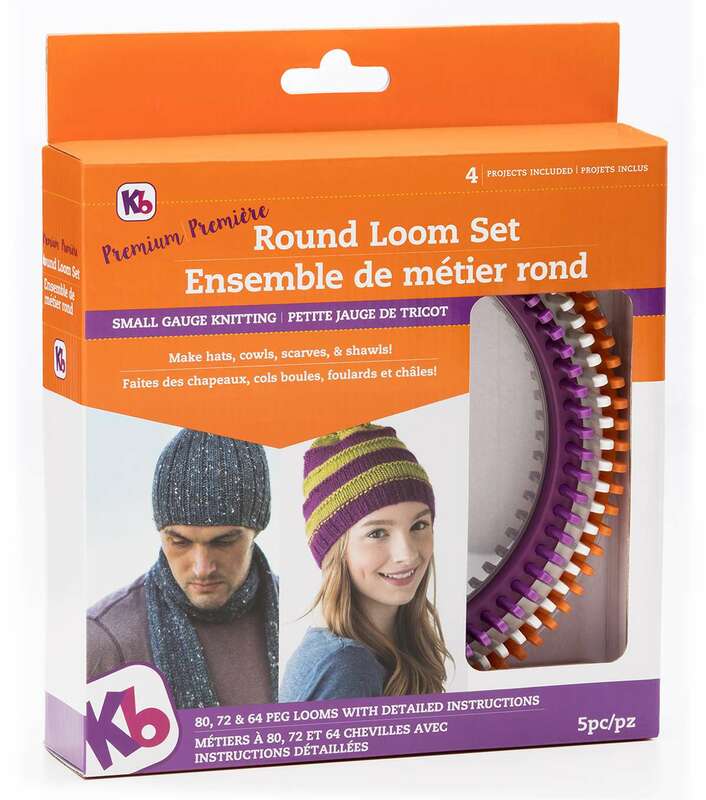 I have often wondered why there was not a round kb loom . I am so happy. Lets do the happy dance. Love the white hat with the flower!!! It’s so nice to see a pattern for a flower finally on loom not too many of those out there. Excited about all the new looms coming out!!! It’s nice see loom knitting getting some notice. will future kits include the 4th loom in the smaller size? or be available separately?, for making preemie baby hats, mittens, and slippers. Now you can get all your Zippy parts in one set !! With the Zippy Master Set, we are introducing new Zippy “L” connectors and straight connectors to give you even more connection options than ever before! 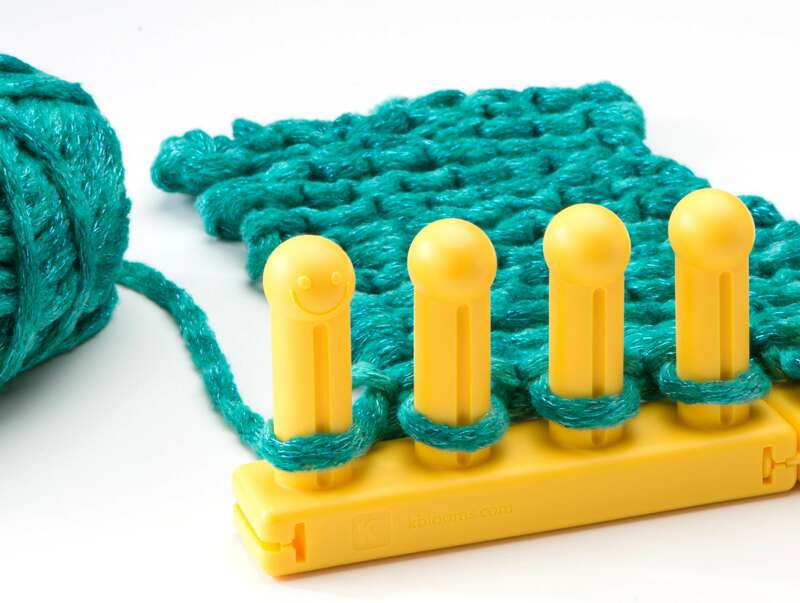 Knitting on Zippy Loom is the easiest and fastest way to knit! 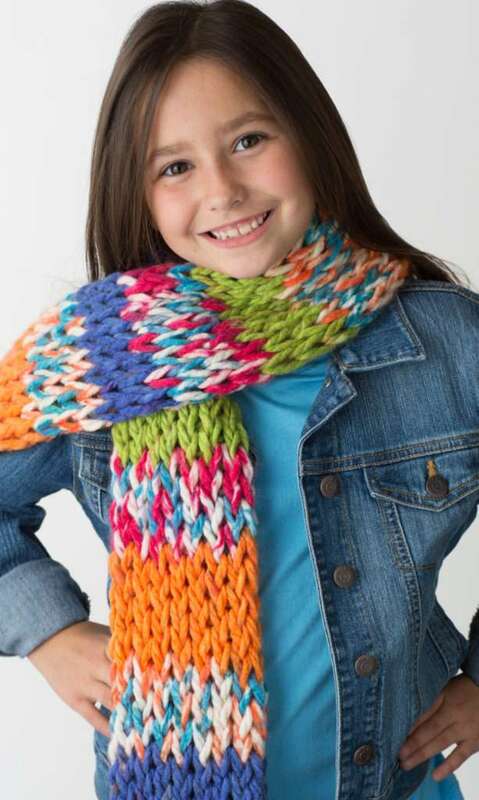 With one Zippy create a scarf in 10-15 minutes. Great tool for beginners to learn loom knitting , and experienced knitters who want to create beautiful chunky knits quickly. The Zippy Master Set includes: (4) Zippys, (4) Corners, (4) “L” connectors, (2) Straight connectors, (4) regular connectors, (4) projects, step by step instructions and knit hook. 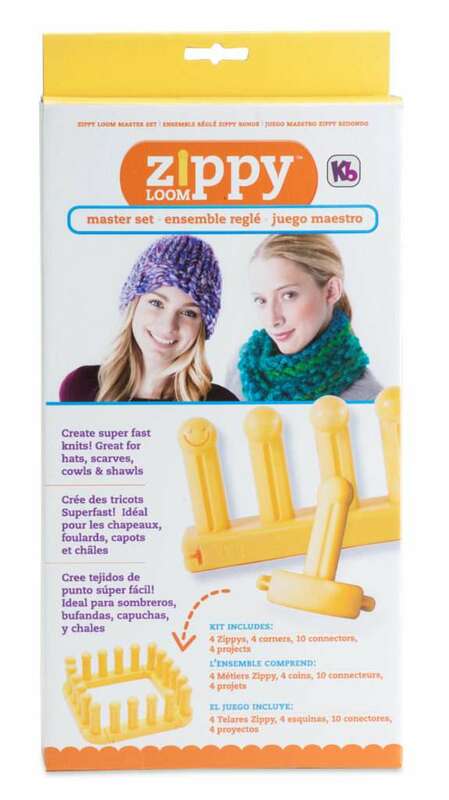 Connect with Zippy Corners to make a 20 peg loom for adult hats, or cowls. With the brand new “L” connectors, make a 16 peg loom for kid’s hats, or use the straight connectors for double knitting. Mix Zippys + super bulky yarn to create super fast knits! 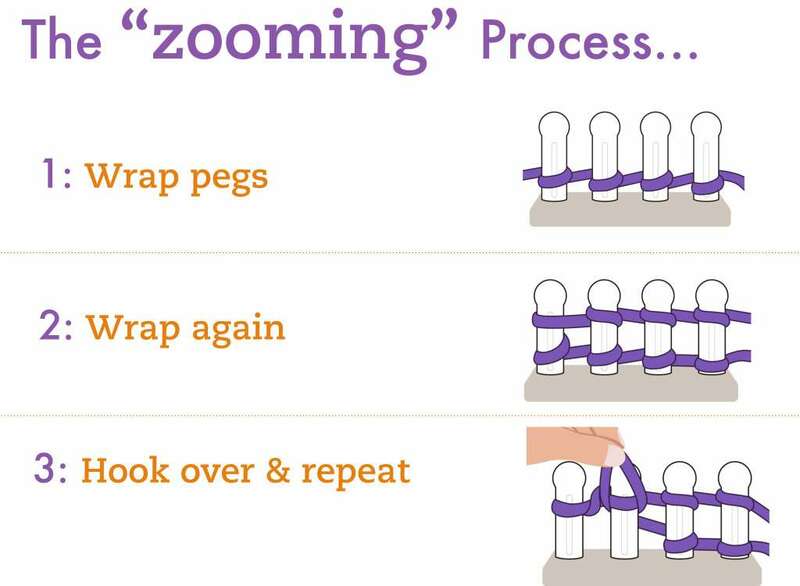 Check out Zippy Loom patterns and Zippy Loom videos! 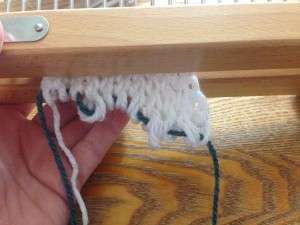 To set up Zippy Looms to make a child size hat use the “L” connectors (above see connected), to make a 16 peg loom. 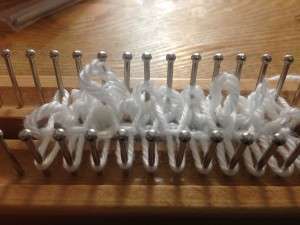 To set up Zippy Looms for double knitting, use (2) 8 peg Zippys and add the straight connectors to create a double knitting loom (see below). Double Knit on Zippy for extra chunky scarf! Watch above to see Zippy Connections in Action! I have 10 zippys and4 connectors How can I get the straight connector? 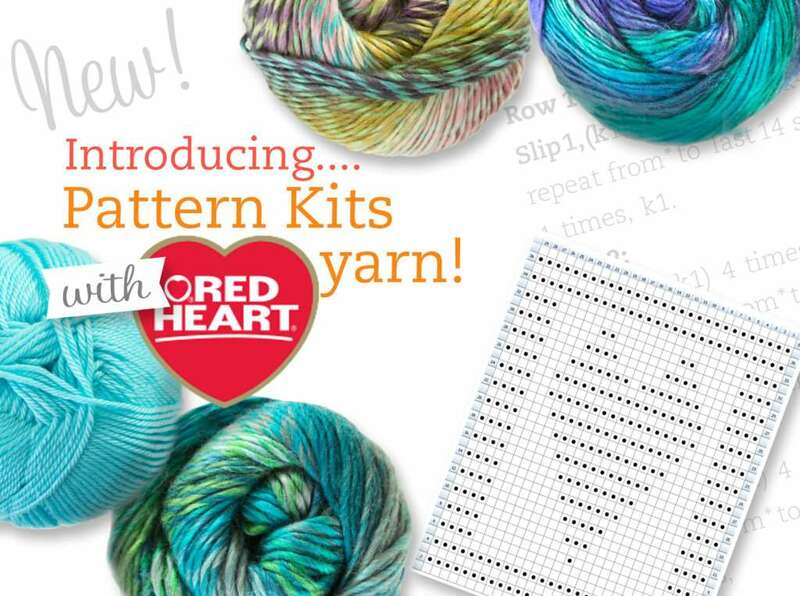 NEW Pattern Kits with Red Heart Yarns! to bring great yarns and NEW PATTERN KITS to KB looms! We’re excited to Partner with Red Heart Yarns, one of the most widely-recognized brands in the USA. Red Heart is the Winner of the Women’s Choice Award and voted the most recommended yarn brand. Red Heart yarn has been the choice of millions of crocheters and knitters for more than 80 years. Now we are bringing the Best of Red Heart to you! Also check out the New Pattern Kits! It’s one stop shopping. 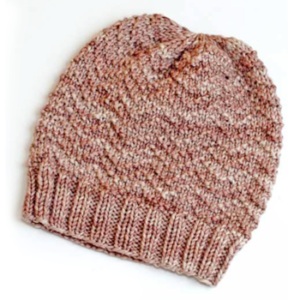 The kits include all yarn needed for each project, downloadable pattern, and a knitting loom. Our initial kit offerings include a baby blanket, large afghan, 2 shawls and 2 fun summer socks. Our design team worked hard to create these beautiful knits. (Simply click on the photo to view all kits). We hope you enjoy! Do you have great zippy ideas? What have you made on your zippy looms? Make a video of your creative idea and enter to win prizes!! Entering is as simple as using the Zippy! 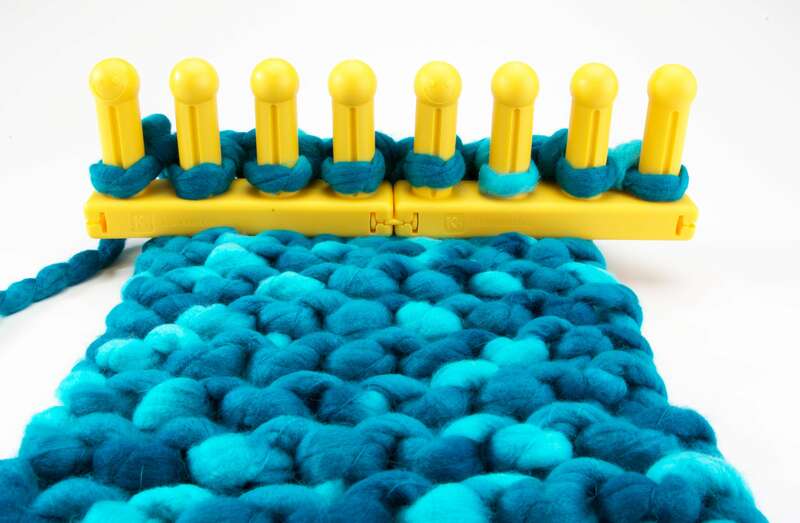 We are looking for creativity and originality on fun ways to use the zippy loom. Some ideas for video…How-to knit? Kids knitting on Zippy? Use of innovative material on Zippy. How many Zippys can you knit with? Do your pets like Zippy? Don’t have a Zippy, that’s OK too, make a video on what you would make if you had a Zippy. These are a few ideas. Have fun with Zippy and enter as many times as you like. Each person who enters receives a prize! AND 3 placing prize winners will be chosen, and videos shared on blog and social media. Videos will be judged on number of views and content! Contest ends April 15th. What’s on your Zippy Loom?? I cannot find the info for the BUY 2 ZIPPY”S&GET 1 FREE Offer that is mentioned in the header on the Home page. I am interested in checking the offer out, please. Thanks. 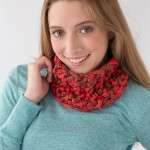 The Zippy is super cool, I have been making scarfs with the ruffle yarn, using just one. Made a neckwarmer in a short time today. When you put 2 Zippys in your cart the 3rd will pop in there. No coupon needed. Can I purchase zippy corner and 1 loom and get another loom for free or does it have to be 2 looms and get a third free. Hi Ginny, This special is pretty much set and the bonus loom is automatic; it does require 2 zippy loom to be purchased. If you purchase 2 looms and 1 set of corners, it will automatically send you a free loom. Make the extra loom a gift or save it for another time. Thank you. We would like to thank all our readers for your support and for the feedback we have received during the past year. We love our customers and we are out on a mission to give you not only the best loom knitting products, but also the best place to come for information on loom knitting, anything from stitches to patterns! 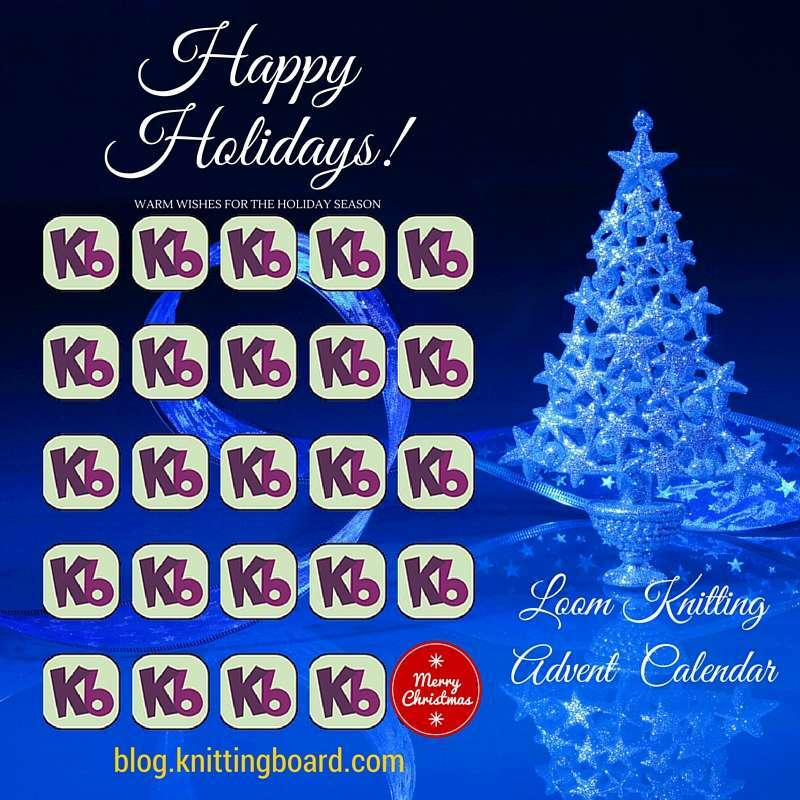 As a thank you for our gratitude, we have put together a Loom Knitting Advent Calendar for you. Starting today, December 1st and going through December 24th, we will release one new pattern for your enjoyment. 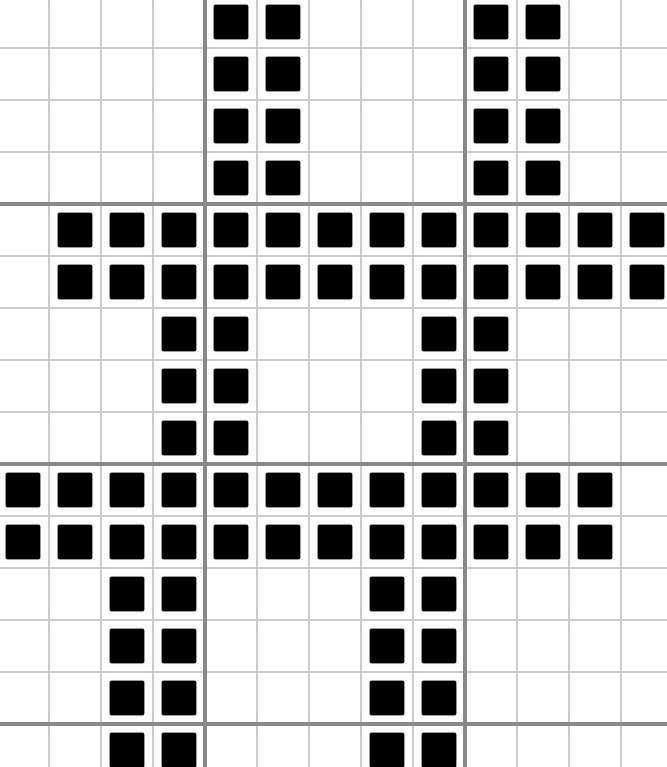 The patterns will range in variety and difficulty. Each pattern will be posted by 6pm MST, starting today. We hope that you enjoy the designs! The KB Team would like to wish you a wonderful holiday season. May the peace and beauty of the season remain with you throughout the coming year. Can’t wait!! C’mon 6 p.m.!!! What a wonderful gift to all us knitters. Can’t wait to see all the great “new” things. Thanks so much. Happy Holidays to you and yours. I want to personally thank you for all that you do for use! Have a very blessed Christmas and New Years!!! Muchas gracias. Me encanta recibir información de ustedes y poder aprender siempre un poquito más. Un fuerte abrazo desde Limón, Costa Rica. Felices Pascuas y un venturoso y prospero Año 2016. Muchisimas gracias! Que te pases una navidad muy linda con tu familia. Sue, thank you! Happy holidays! Thank you Shelley! May you have a wonderful holiday. Thank you Karen! May you have lovely holiday season. thank you! what a wonderful idea! Great idea thank you so much! Best of the holiday season to you & the Knitting Board staff and contributors! I can’t wait,I can’t wait!! NEW!! Now you can knit Zippy in the round. Zippy Corners come as a set of 4 corners and easily attach to Zippy Looms. Making hats, cowls, blankets and shawls is a breeze and super fast too! Check out the new Patterns using Zippy Corners! I just started using your zippy looms. The only drawback I see so far is that I have to be really careful not to snag the yarn on the cute little smilelyface on the first peg. I guess I will jist have to be extra careful. It slows me down, but I have to deal with it. Otherwise, I can’t wait to try some of the different patterns you offer. Thanks for a great product. Join us for our Facebook worldwide contest! Please send in photos of your Zippy knits. Hop on over to our FB page and share your photos, be sure to put your photos under the Zippy Contest post (it shows the info graphic above). If you are not from US or CANADA, we know Zippys are harder to find and we will accept entries made using another KB loom. When posting photo, please note your country. Three winners will be chosen on August 16th. Grand prize winner will get 3 Zippy Looms. Second prize winner will get 2 Zippy Looms. Thirst prize winner will get 1 Zippy Loom. Contest ends on August 15th, midnight, MST. Photos must be posted by midnight on August 15, 2015. Details: Item must be made on a Zippy loom or several Zippy looms. 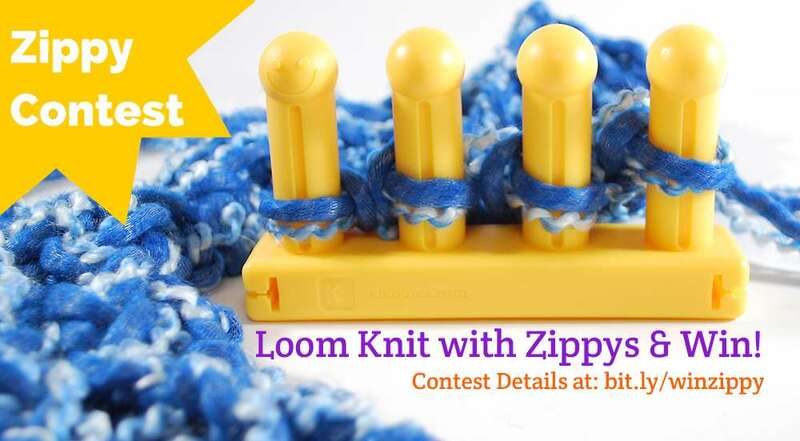 Projects completed in other knitting looms are ineligible to enter for this contest. Each individual is allowed up to 5 different and distinct entries. Winners will be chosen by the KB team based on originality of the pattern, creativity, and overall appeal. Earn an extra entry by commenting on this blogpost. Share this Blogpost and earn an additional entry. Simply write in the blog comments that you shared it on FB/Twitter/Instagram for an additional entry; that is 2 additional entries by simply commenting and sharing. Love the new zippy loom. Its fun to use thanks to the cute smiley face. I love the ease of which projects can be made and that I can use either the hook or my fingers. The price is right and the possibilities are endless! OMG I love my Zippy looms.. Would love 2 more. I covered another looms collar, but I’m sure it will be better zippy loom. Love Zippy cannot wait to make many more projects. Oh boy! you will not know how much I love the new Zippy. Everything I make I donate to charity. I do not sell anything, I make just to let you know. I have 7 Zippy looms. I kinda changed the looms to fit my project I was going to do. So, I pictured the loom with my project which I was making a scarf. I need 400 scarves by fall. They have to go with all the hat’s that I already made. Posted on Twitter. I love using the knitting looms here in the United States. They make the work go so fast. You don’t have to be concerned about rows becoming uneven, etc. I have 2 zippy looms just as of the other day. Im already falling in love with them. Post shared on facebook. ? These zippies are so much fun to use! Most everything I make is given away. Sharing this on Facebook. 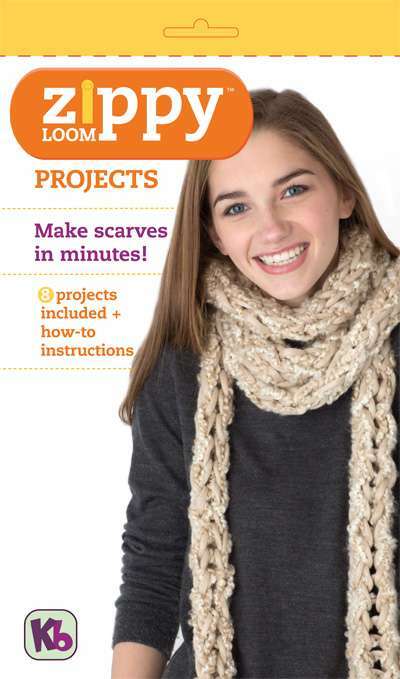 Knit a scarf in 15 minutes! 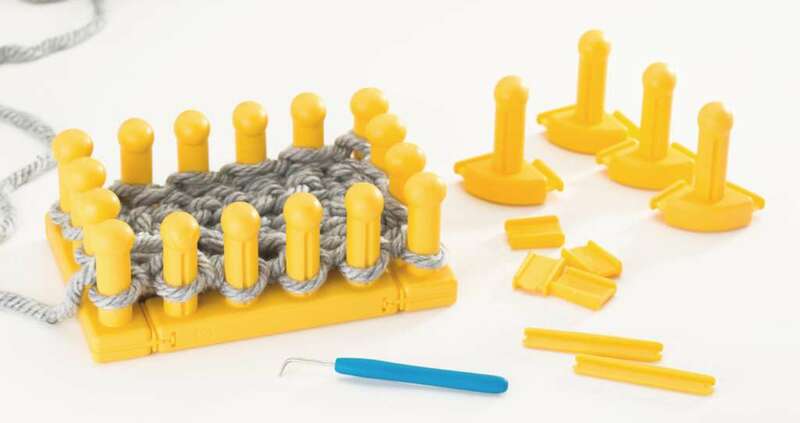 Zippy Loom makes knitting super fast and easy! 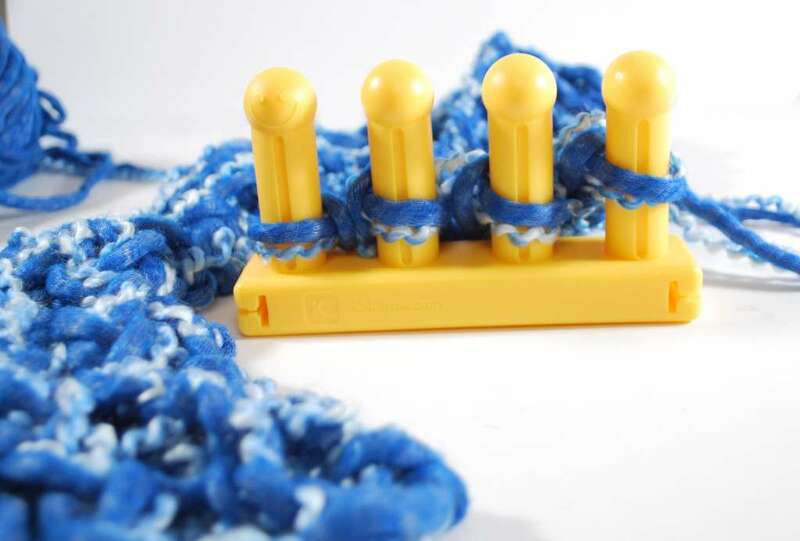 Knit with giant pegs and super bulky yarn to create SUPER quick projects. Works great with ruffle and boucle yarn too! Each Zippy comes with a connector to attach to more Zippys. With one Zippy you can create approx. 3″ width of knitting. For wider scarves, 2 Zippys work great. For shawls, 3 Zippys are recommended. 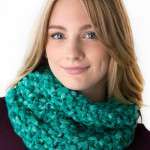 Make scarves, cowls, necklaces, headbands and simple 3 minute bracelets!! 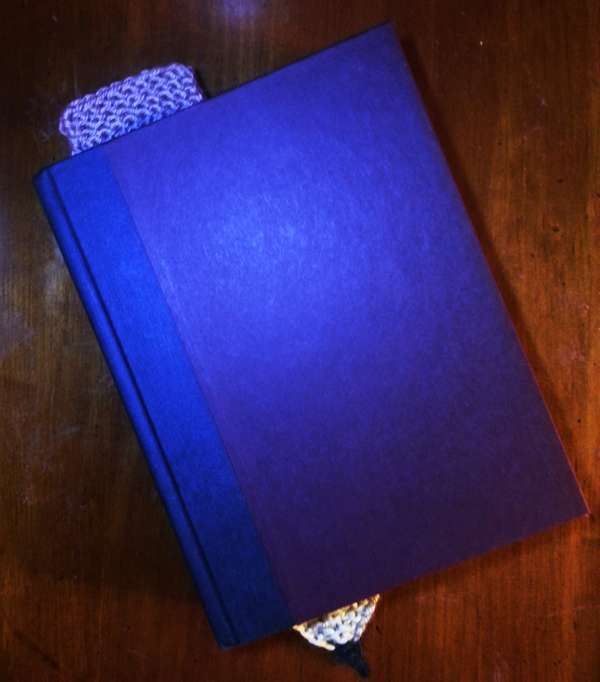 Zippy Project Book 26 pages, includes complete step by step instructions and 8 projects. 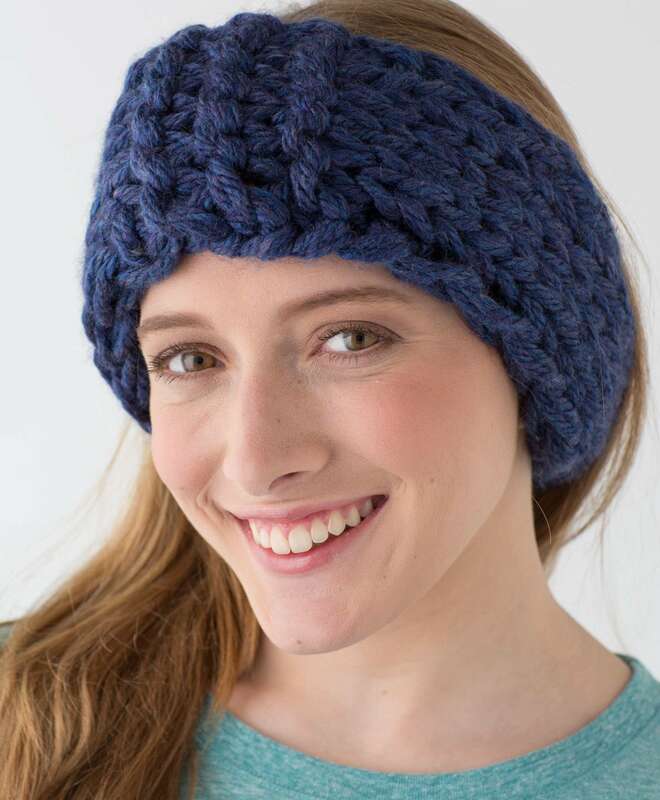 Super easy – no knitting experience needed. I purchased 3 of the Zippy looms and I love them! I Ordered 2 zippy looms today. What’s the best yarn to use? 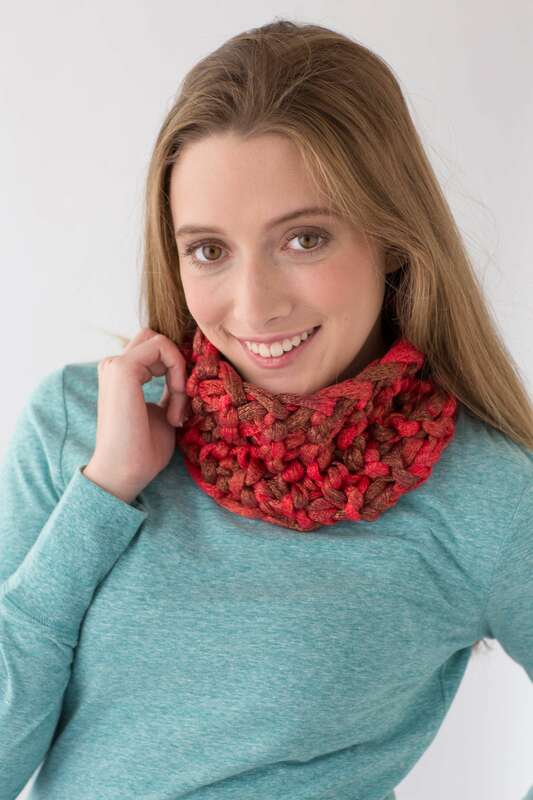 How would you make a ruffle scarf using either Red Heart Sashay or Starbella yarn? All loom directions I’ve seen prevously use a rectangle loom so you can move the loop from the front to the back peg. We would like to thank everyone who participated in our loom-a-long contest. It was nice to see all the beautiful finished Couture Cloches. Great job everyone! Trying out new stitches and techniques can be unnerving and you all did fantastic! 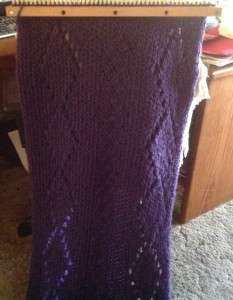 You can see all the finished projects at this link on Ravelry. The winner of the knitting loom is…. Angie, please contact Pat at pat@knittingboard.com with your choice of knitting loom. Thank you to everyone for participating. Stay tuned for more contests and be sure to follow our Loom-a-Long group and our Facebook page. We are having another Loom-a-Long contest in June! Hop on over and find out what project we are tackling this month. My prize came today…28 inch knitting board with extenders. Thank you, KB!! Loom Knitter of Month, MAY announced! It was great seeing all the fabulous knits. Hats off to everyone!!! 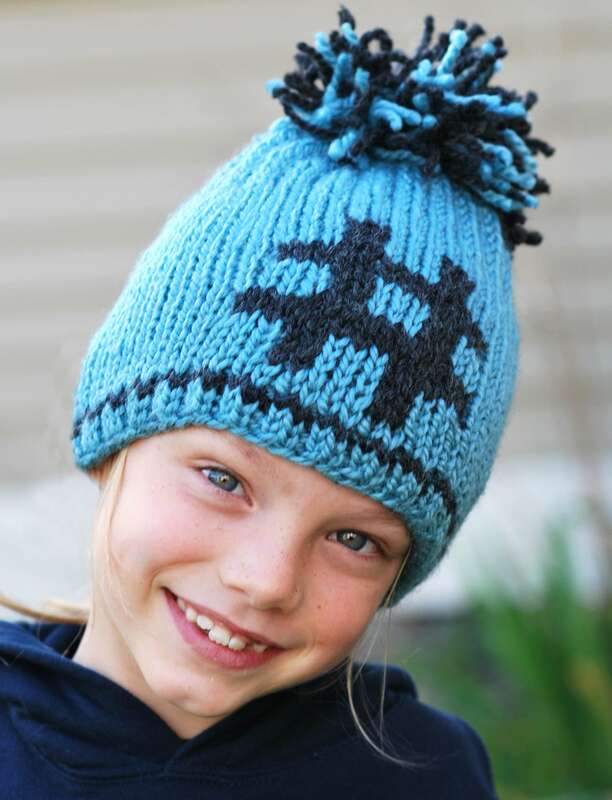 Thank you knitters for entering our contest; we had a lot of fun looking at all the beautiful knits. There were over 40 entries, and so many really great projects. It was a very tough selection process and so we decided to select 2 winners. Yay!! Thanks again for all your entries!! Beautiful creations! Congratulations to both. Do you have something fabulous going on your KB Loom that you would like to share with other loom knitters? If so, this contest is for you and you could be our “Loom Knitter of the Month” We want to celebrate loom knitters that are making beautiful, inspiring, and/or super creative knits. Have fun! It will be super great to see all the creative entries. Follow other contestants on facebook. Prize: A new KB Loom of your choice (ship in US only). 1. 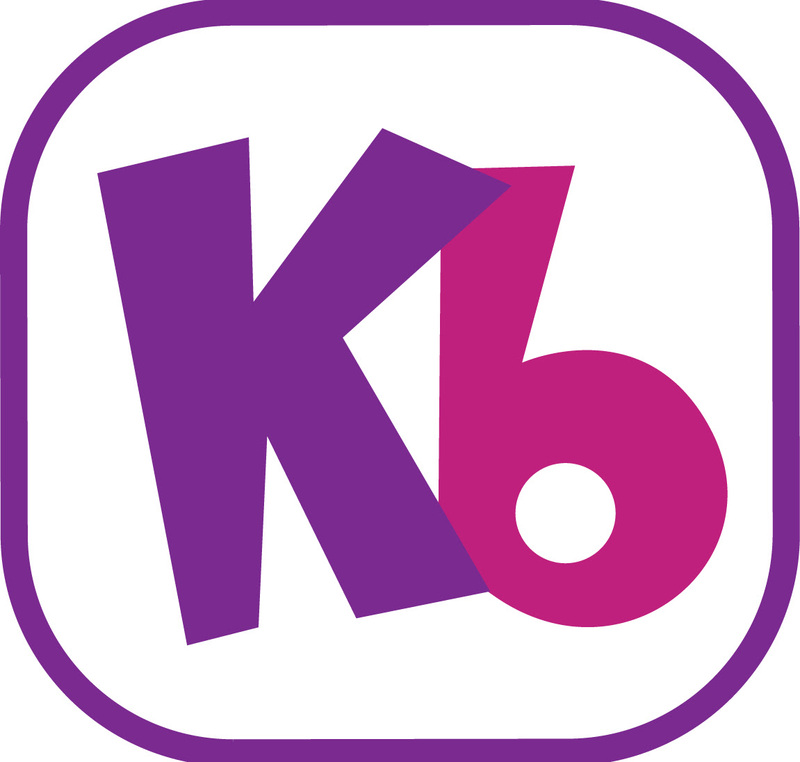 Must to be signed up for the KB loom newsletter. 3. Add photo to facebook contest post. I would love to win a KB Loom. I’ve always wanted one. I dont have a loom yet but i want one soon. I have a shawl on my loom . I am completely addicted to the 4 in 1 hat loom and have made more hats that I could have imagined. 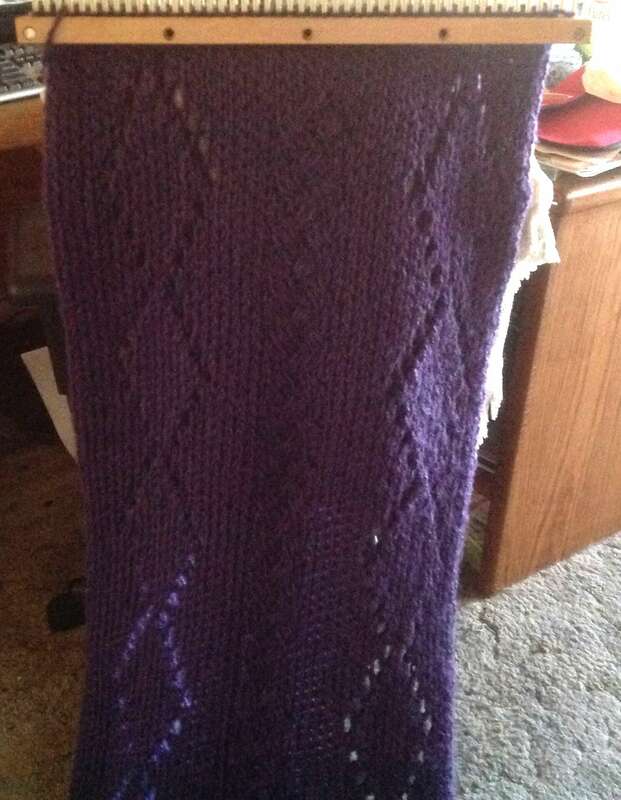 I have entered the knitter of the month contest with hopes of winning another loom. I already have three 10″ looms and 1 fine sock loom. I need this soooooo bad. In the month since my last post, I have done a lot of different things with loom knitting. I have learned to match my needle gauge with my loom gauge, I have written a pattern, and I have been humbled by busting through a few of my assumptions about the projects that are possible on the loom. First off, I have played around a little bit with the different gauges I can create when knitting on the loom. Step one, back to basics: I needed to learn the difference between a true knit stitch and simply a loop over stitch. I thought I knew all about that (plays into the assumptions I need to learn not to have), and was simply hooking my bottom loops over the yarn on the pegs. I think this is because I used to do spool knitting when I was a child and that’s kind of what I remembered about how it worked… well, apparently I didn’t remember as much as I thought. I was not picking up the loop underneath with the tool and then removing the previous loop to replace it with my new loop. This meant that I was having some really painfully tight swatches that were disheartening and frustrating. Well, if I had just read the directions I would have realized I wasn’t doing a true knit stitch. I didn’t take a photo of this stage because I was so frustrated that I just ripped the whole thing out! After switching to real knit stitches (insert hook under the bottom loop, pick up the top loop and remove both from the peg, replacing the new loop on the peg), what a difference! It still looked tight to me on the loom, but I think that was because I was expecting it to look the same as it does on needles, which it wouldn’t until it’s removed from the loom. This little mistake/learning opportunity led to my second lesson of the month. After this realization, I took the time to do some comparison gauge swatches to calibrate my own opinion about the capabilities of the loom. I am so glad I did this. I will admit: I originally assumed that the only projects that were possible on the loom were large bulky projects. I have been pleasantly surprised to find out that this simply isn’t true. For those of you that don’t needle knit, this part might be boring, but for others… I learned that I have a whole new range of projects that I can expect to be able to work on the loom! With a little effort I can convert lots of needle-knitting patterns to loom patterns! Finally for this month, I decided to jump in with both feet and write a loom knitting pattern. 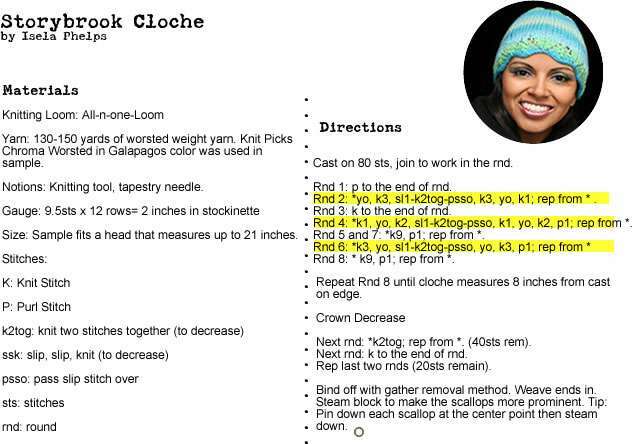 My dear friend Isela helped teach me how to convert a pattern into loom knitting terms. Although increases and decreases are not as easy to do on a loom; that certainly doesn’t mean you have to avoid shaped items! The chubby bunny was born last month and I think he came out quite cute. I tried to avoid all increases and decreases as much as possible and instead used sewing methods and cinching methods to turn simple straightforward panels into a round, plump, loving bunny! I would love to hear your feedback on my first pattern. ? 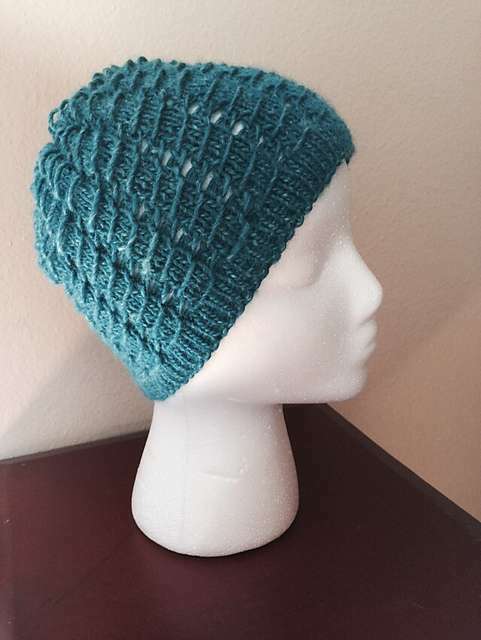 This can be found under the free patterns tab. Once again, I found all sorts of new lessons while adventuring into loom knitting. Thanks for reading! I am now starting my first fully loom knitted item with a purpose, so I will hopefully have that finished for you next month. I’ll keep it a secret until it’s done. Stay tuned! I loved reading your article! I too had the same assumptions. Thanks for clarifying those assumptions. Now I have a newfound excitement for trying out some other loom projects! Hello everyone! My name is Adrian. 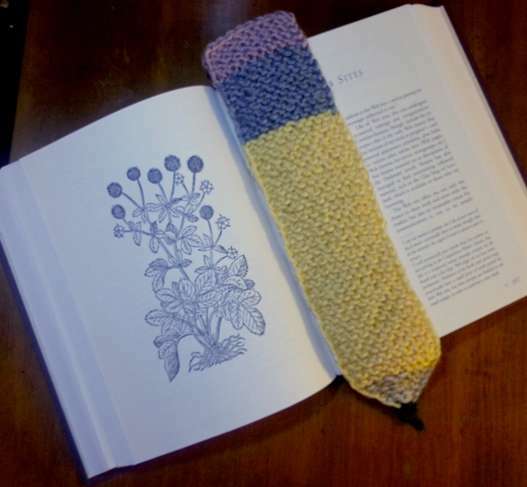 My dear friend Isela recently introduced me to loom knitting, and we thought it could be useful, educational, and probably pretty entertaining for me to document and share my learning curve along the way. Over the next few months you will be hearing from me about the hiccups, the troubles, the funny stories, and the lessons (life or knitting) that crop up. I’ll try to keep the inspirational quotes to a minimum, but when the mood strikes…! I’ll give you a tiny introduction before I tell you about my first day on a knitting loom. I have been crafting of some sort since I was a child. I grew up in a very crafty environment in a family of people whose hands were always busy. My father’s family are long-standing “mountain people” who are never idle while we sit and “visit.” So, it was extremely common to always have something in my hands to work on or play with while talking, riding in the car, watching tv, or just intentionally sitting and crafting together on a rainy afternoon. 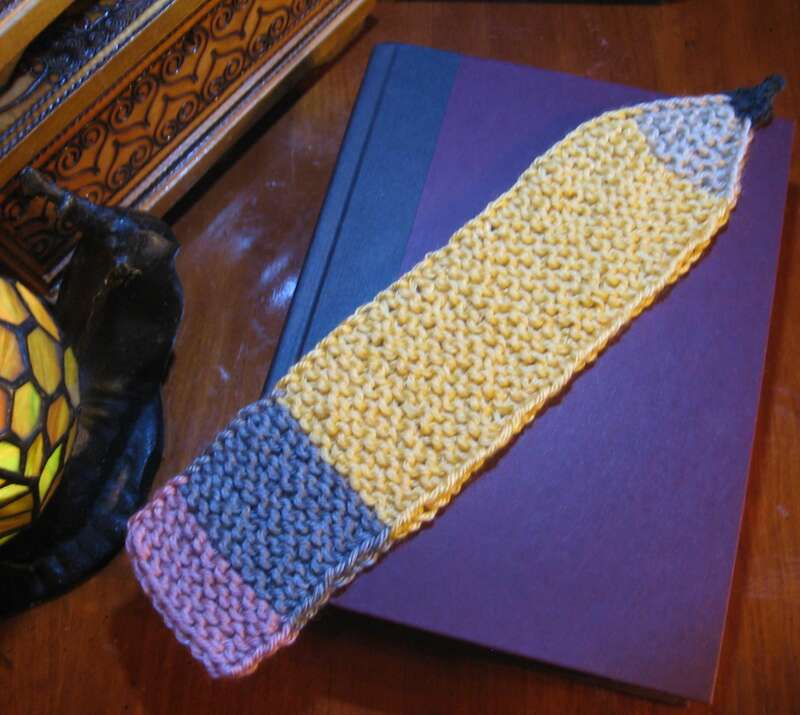 I learned to crochet from my Aunt Jane when very young, and did loads and loads of cross-stitch over the years. My mother is a phenomenally talented and world-renowned hand weaver and seamstress with a lovely home studio where I was lucky enough to receive all sorts of “lessons”. Needless to say, there has been fiber and yarn around me my entire life. It was always easy to find some sort of project around to keep me busy. However, despite all of this, I have never tried my hand at loom knitting, so here we are! Loops everywhere! No way to straighten it out! Eep! The anchor yarn is really important to be able to pull the knitting down through the center and even out all the stitches. So I pulled it out to start again. After casting on again, with an anchor yarn this time, and tugging gently down on the anchor yarn between rows, everything looks much better! Yes, I know this is basic… but really… sometimes those are the easiest things to screw up. I continued knitting in plain stockinette all the way around for a few more rounds. 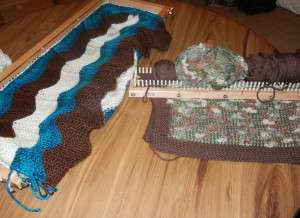 I started to see as my knitting got long enough to extend below the loom that something wasn’t right! My bottom edge was longer and looser on one side than the other. After reading that, I kept going with another dozen or so rows, changing each time where I started moving my loops and everything sorted out quite nicely. After changing my method for the next rows, I now can’t even tell which side was too long. I decided that after this initial “testing” of loom knitting, I want to now get cracking on a project that I will want to keep… but that will be the next post. All around, I’m pretty pleased with my first foray into loom knitting! The first row or two were hard for me, but I very quickly picked up a rhythm for my hand, and comfort with the board, and a better understanding of how knitting itself works, particularly knitting double layer fabric like I was here. On to bigger and better adventures/projects/lessons in the next post! Welcome! I’m bookmarking this post of yours so I can give it to a few people 🙂 Thank you for sharing your experiences, and happy looming! Welcome to the wonderful world of looming. Lucky you to have such a good friend to help you along. I remember my first experiences over 9 years ago and can laugh about them now. All I had was a board my husband made and few instructions. The figure 8 was all I knew! Can’t wait to read more of your learning experiences. Thanks for sharing with all us. Our annual drive for warm hand knit clothing has begun. We donate every December to our American Veterans homes and hospitals. They need hats, scarves, blankets, and mittens. We also like to share some baby items for the Abused Mothers with small children. This could be infant size hats and wraps in all sizes. 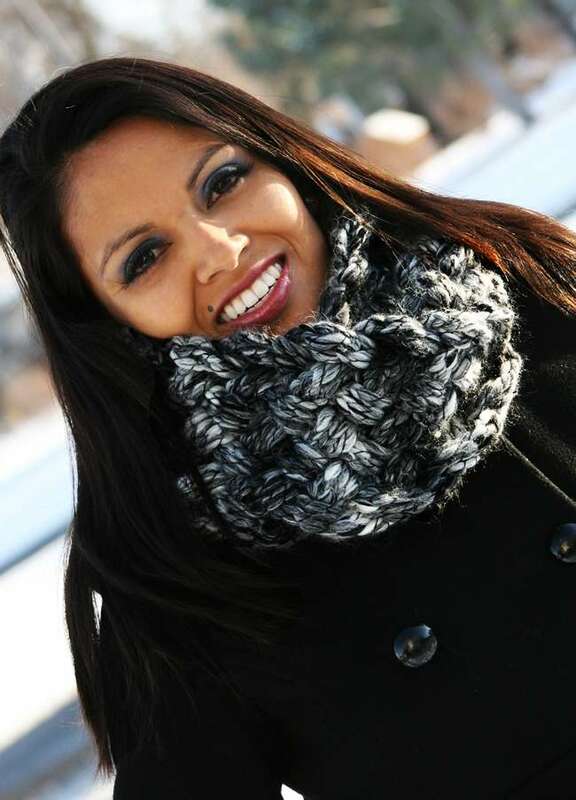 In the past, we also sent warm items to St Joseph’s Indian School in South Dakota. 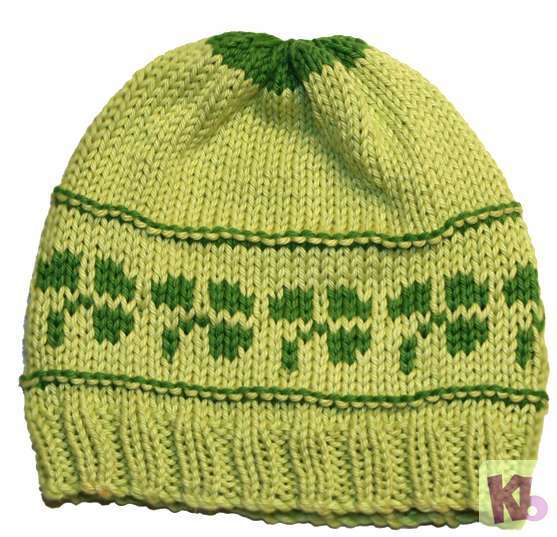 The children love to get something that is hand made like a hat or scarf to keep them warm. If you can knit up just one or two items, we will make sure they get to some very needy folks. It’s a great way to use up some yarn remnants and clean out the closet. They are especially great if a note from the knitter is attached with joyous, holiday sentiments. Won’t you take an afternoon to brighten someone’s spirit and warm their cold heads and necks? We thank you for your time and energy, and sharing spirits. Send donations to address below by the end of December, 2014. Have some fun and hashtag you! Great project for beginners using 2 stitch variations. It is sized for youth with an option for an adult. Special Note: Using the full width of this loom makes a youth/small size hat. 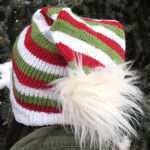 To knit a larger hat as in our sample, we have added a small back panel to increase the width. Using a larger loom ie the 28” loom will result in larger gauge and larger stitches which will change the shape slightly of the ‘hashtag’. Cast On all pegs or 48 stitches in Rib Stitch using Teal Yarn. Lay anchor yarn of contrast color yarn. Work (2) rows in Rib stitch. Tie on color 2 Charcoal at 2nd peg. Do not cut the Teal yarn. Work (1) row in Rib stitch with Charcoal yarn. Cut and knot. Work (1) additional row in Rib with Teal yarn. Change to stockinette and work (2) rows. Hints: Mark the center of the loom with a stitch marker or pin. Next row will be row 1 of the bottom of ‘hashtag’. Whenever you are working the Charcoal for just the 2 stitches of each upright, weave the 2 consecutive pegs front to back and move over to 2nd upright and weave the 2 consecutive pegs front to back. Then, weave the Teal yarn in Stockinette weave skipping the upright pegs. When, you are working the long rows of charcoal, weave the stitches in stockinette, and then weave the Teal yarn in Stockinette weave skipping the charcoal stitches. Notice in your graph that the uprights will shift over by (1) stitch to give the design an angled look. Go to center of loom, count back (4) stitches and tie on the Charcoal yarn. Work the (4) upright stitches. Note that there will be 3 pegs skipped in center of them. Lay the charcoal yarn down where you end. It doesn’t matter which direction you do the front to back for the 2 uprights. Weave the row with the Teal yarn and hook over. The ‘hashtag’ design consists of a total of (15) rows. Once complete, you can cut and knot the Charcoal yarn. Hat will be completed in Teal Yarn. Work (7) additional rows in Stockinette. Change to Rib stitch. Work total of (14) Rib rows to top of hat. Work Decrease row on row #6 and row #10. 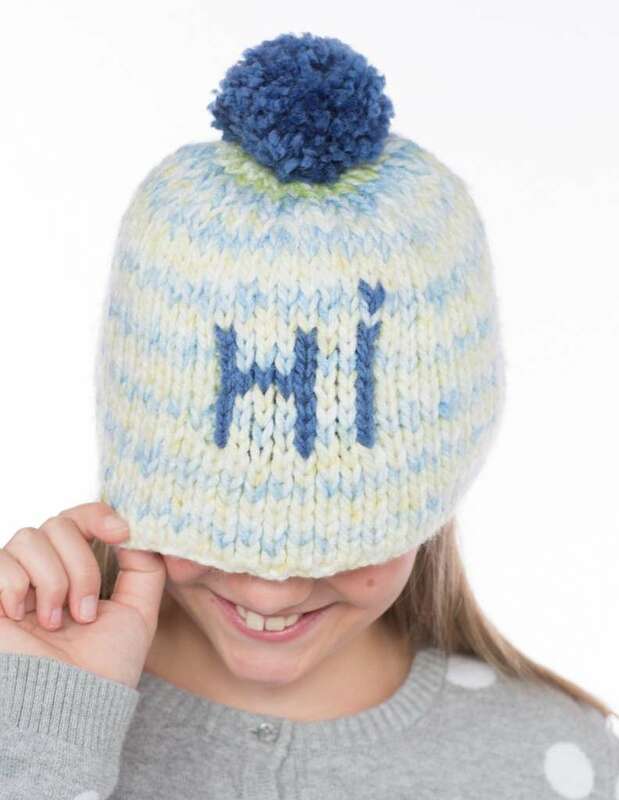 Decrease Row explained: decreasing some stitches at top part of the hat will add some shape to the head and keep the top of the hat from being too ‘bunchy’ or bulky. So, we will do a decrease to 2 stitches on each side of the design. That will take out a total of 4 stitches on each decrease row and make the top of hat fit much better. Before doing the weaving and hook- over, go to stitch #8 from left side. Lift the stitch and place it on peg #9. Go to stitch #12 from left side. Lift the stitch and place it on peg #13. Now you have 2 empty pegs. Go to right side of loom and count over to peg #8 and place this stitch on adjacent peg to left. Count over to peg #12 and place this stitch on adjacent peg to left. Do this to both sides of the board directly across from each other. You now have (4) empty pegs on each board. Carefully, lift the stitches and move towards the center of loom. You want the empties to be at ends of loom. Now, weave and hook over the row carefully lifting all loops on each peg so that only the one loop remains on the pegs. Continue working in Rib stitch. Repeat this decrease process on row #10. 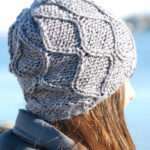 Complete the hat with Rib stitch. Removing the hat from loom: Since we are at the top of the hat, we want to create another anchor yarn to gather the top of hat. Do not bind off. Instead, cut and knot the working yarn. Cut another piece of the working yarn about 24” long and thread onto the darning needle. 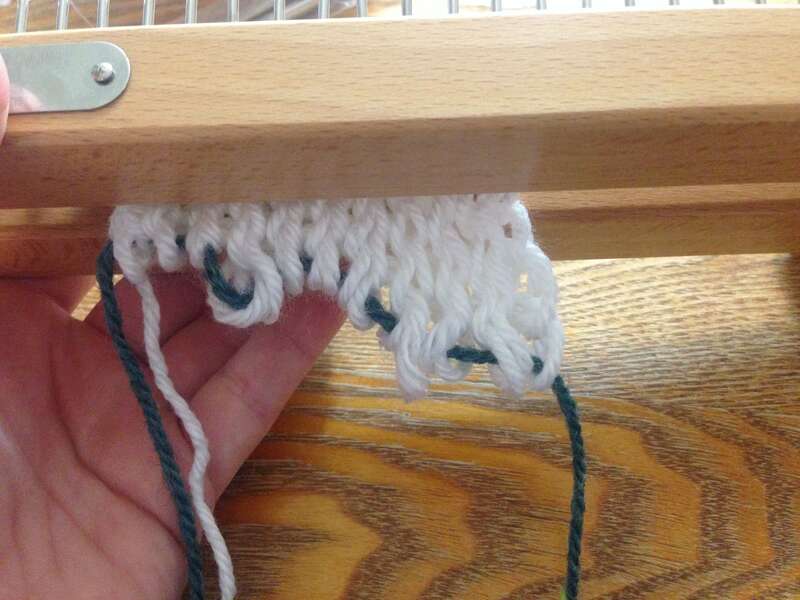 Pick up the stitches working from one board to the other and allow the stitches to come off the loom onto the yarn. Small – youth size finishing: Sew the back seam using invisible stitch with matching yarn, Teal. Bind off the brim edge stitches. Gather the top of hat by pulling the yarn securely and tying a secure knot. Hat is ready for a fun pompom. Large adult. In order to add more width to back of hat, we knit a matching piece that will be seamed into the side edges of the hat front. Cast On 10 stitches in Rib stitch. (More if you want a larger than large hat) Our 10 sts will add 4” to the size of the hat. 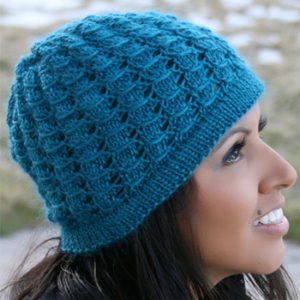 Work this small piece just as you did the hat front only no design is needed and no decreases are needed. Do work the matching stripe on row 3 to match the front of hat. 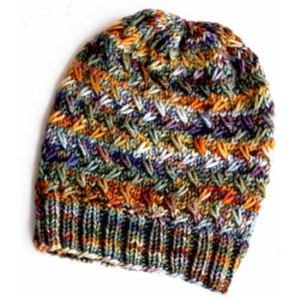 Once complete and free of the loom, seam to the hat front using invisible stitch on both sides connecting the 2 pieces into one round hat. If you use the invisible stitch for the seaming, the seams will not show. Just be sure to match the Charcoal stripe exactly. Now, gather each section with the anchor yarns at top of hat. Tie the yarn securely. Now you can bind off in one continuous yarn at brim. Either size, you are ready for the pompom. We have used both yarns for the pompom in the sample, but you can choose to make it all one color, if desired. Wrap the yarns around a box or anything that will give you approximately 5” long strands. Wrap 20-30 wraps; tie in center very securely. Cut the loops and shake the pompom loose. 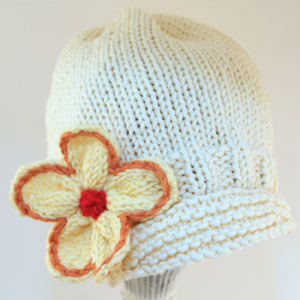 Use the yarn tie of the pompom to secure to top of hat. 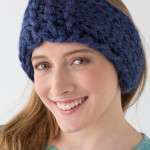 To finish the hat, use the crochet hook to tuck in any yarn tails that remain from the seaming and knotting. Shape the pompom as short or as shaggy as desired. In our sample, we trimmed it up a bit, but left it fairly long. For a complete look, make a matching Hashtag Scarf. Very cute! 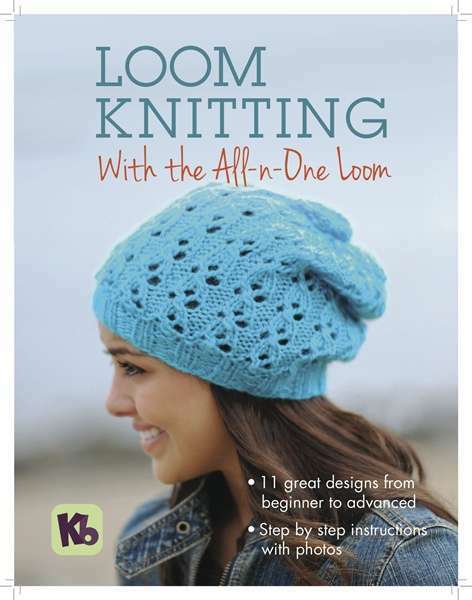 We received a request for a little bit of extra assistance in creating the slouchy hat pictured in the front cover of the All-n-One loom. The instructions for the increase round read: Rnd 9: *k3, m1l; rep from * to the end of rnd (80 sts). 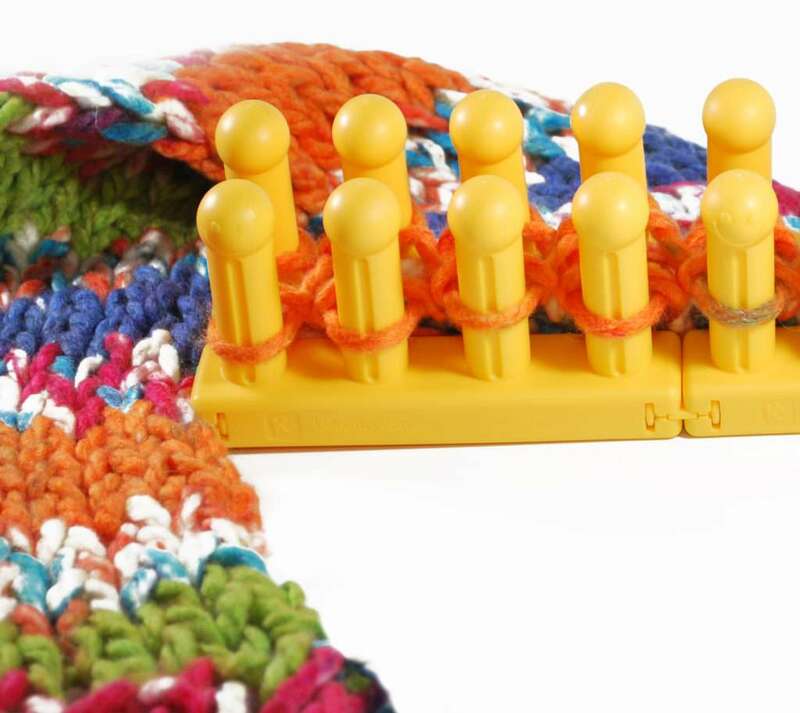 Remove all 60 stitches from the knitting loom and place them on a piece of scrap yarn or on a circular needle. Set your knitting loom to 80 pegs. Place the stitches back on the knitting loom as follows: place 3 stitches back on 3 pegs, skip one peg, place 3 stitches back on 3 pegs, skip one peg, keep repeating this instructions until you have place all stitches back on the knitting loom. *Knit 3 pegs, now create the M1L and place it on the empty peg; repeat from the *. *Knit 3 pegs, M1L and place it on peg 3 (over the loop already there, peg 3 will have 2 loops on it). Continue around the knitting loom repeating this sequence. On the following round: knit 2 pegs, lift the loop that is at the top of peg 3 and hold it or place it on peg 4, knit the loop on peg 3, place the loop that you were holding back on top of peg 3 (or move it from peg 4 back to peg 3), knit this loop (be sure to only knit the top loop and leave the one at the bottom untouched). Continue around the loom repeating this sequence. Now, remove all the stitches from the knitting loom and place them on a piece of scrap yarn or a circular needle. Place your stitches back on the knitting loom. I hope the above helps to facilitate the increases. It is the most laborious round of the hat, take it slow and one step at a time. what happened to the video of the triangle Isela phelps taught for a blanket. Quick and fun thank you gifts for teachers at the end of the school year, this project can be used as a bookmark or decoration. CDD= Central double decrease—working with 3 stitches, move the stitches on either side of the center peg onto the center peg so that there are 3 loops on the center peg. Knit all three loops together as one. Move remaining stitches in so there are not any empty pegs. BO by pulling working yarn through last stitch. We have had a few inquiries about the Storybrook Cloche. I decided to provide you with a breakdown of the rows. I hope it helps the process a little bit. Skip peg 4 with yarn behind peg. Move loop from peg 5 to 6. Knit peg 7 and then move it to peg 6. Thank you for posting this. This pattern has raised a lot of questions. 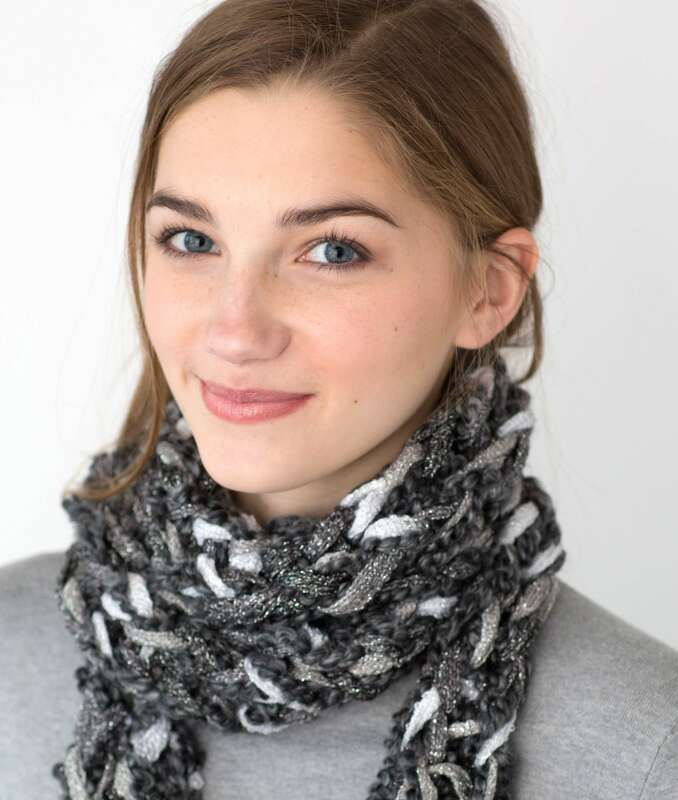 Would you be so kind to post a break down for the Brilynn Cowl too? Would love to make it! Thank you. Yay! I’m trying to make the Peaks Fingerless Mitts from the Sock Loom Projects book and I couldn’t find other instructions for the Peaks pattern. Sounds like this pattern is similar, at least to help me with some of the stitches. Video one shows Rows 1-3. Video 2 shows Row 4. 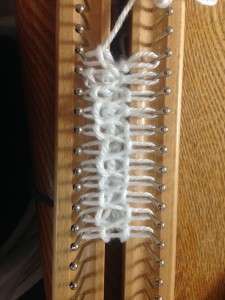 Most of us learn to loom knit with the e-wrap cast on method. We quickly realize that it produces a loopy cast on. Here is a tip that I have used for several years in a lot of my knits. Enjoy!